Brie with Aged Cheddar Grilled Cheese sandwiches will wake up your adult senses from the boring kid-friendly grilled cheese sandwich of your childhood. This is a sandwich recipe I found while watching America’s Test Kitchen on Netflix, so I can’t take full credit for it. However, I will take credit for the addition of the French fried onions that I on top of the cheese, and the honey that’s added to the Dijon butter that’s spread on the bread before grilling. 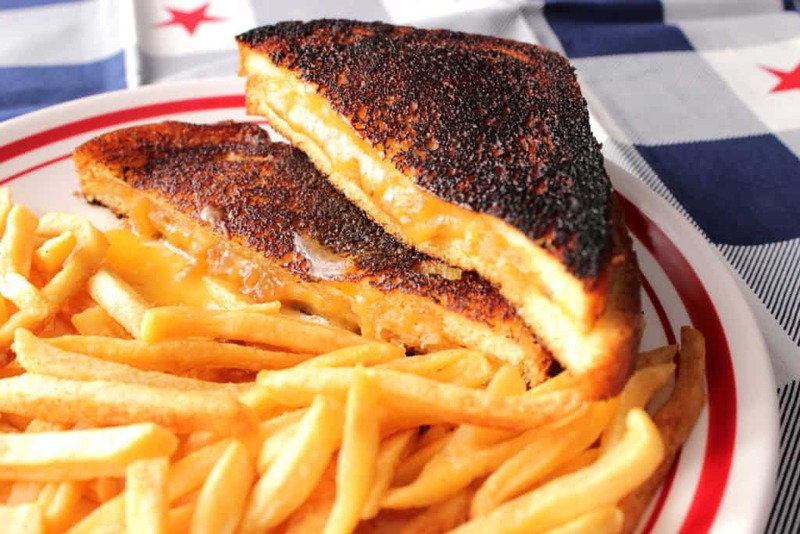 With ingredients like sharp aged cheddar cheeses, creamy, mild tasting brie, a splash of crisp white wine, crunchy French fried onions, a touch of tangy Dijon mustard, and some sweet creamery butter, this isn’t your typical grilled cheese sandwich. I think you’ll agree, it’s more like a grilled cheese sandWISH. And I wish I had another one right about NOW! Cube the aged yellow cheddar and aged white cheddar and place them in a food processor. Pulse until the cheese forms crumble. Slice off the rind from the brie cheese (front, back and sides) and cut the cheese into cubes. Add the cubed brie into the crumbled aged cheddar in the food processor. Add a splash of white wine and pulse until the mixture packs lightly together, but don’t go too far as you still want it a little loose. Transfer the processed cheese into a bowl. In another bowl, use a spoon to stir together softened butter, Dijon mustard and honey. Using the honey Dijon butter, liberally butter the outside of 12 slices of bread. Place the butter side down and liberally spread the cheese mixture on the bread. Top with some French fried onions and top with another slice of buttered bread, butter side up. Place the sandwiches in a preheated skillet and cook on medium/low heat until the bread is golden and the cheese is slightly melted. Flip the sandwich and cook on the other side, covering if needed, to thoroughly melt the cheese. Continue the same process with the additional sandwiches. 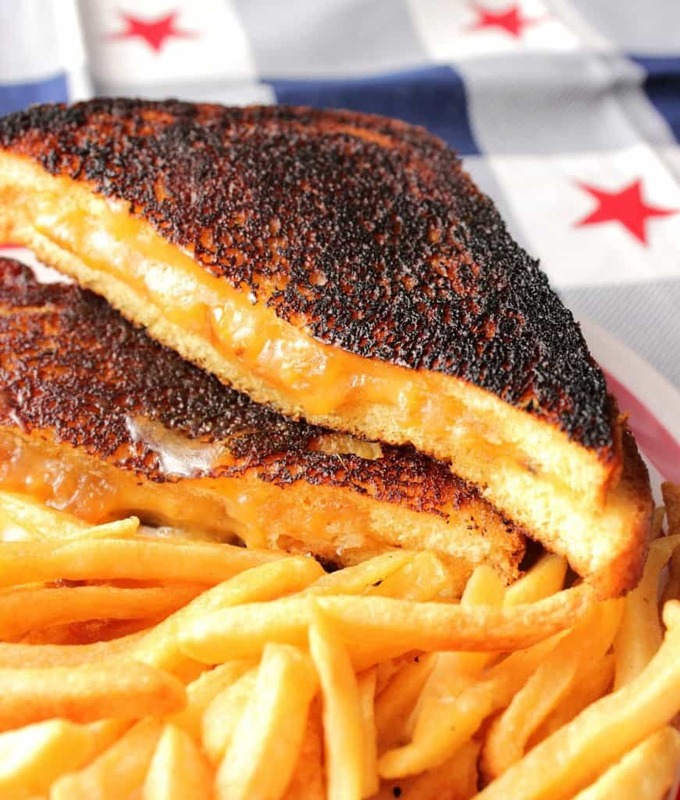 A grilled cheese sandwich for grown up tastes. Cube the cheddar cheeses and pulse them in a food processor until crumbled. Add the cubed brie (rind removed) and the white wine. Pulse until combined but not packed tightly. Transfer the cheese into a medium bowl and set aside. In another medium bowl, stir together the softened butter, honey and Dijon mustard until combined. Place 6 slices of bread, butter side down on a working surface. Divide and spread the cheese evenly among the 6 slices of bread. Top the cheese of each sandwich evenly with the French fried onions. Place the remaining buttered bread, butter side up, on top of each sandwich. Preheat a large skillet on a medium heat. Place 2 sandwiches in the skillet and cook on the first side until golden and the cheese is just beginning to melt. Use a spatula to flip the sandwiches, cover if needed (to completely melt the cheese) and continue cooking on the other side until golden. 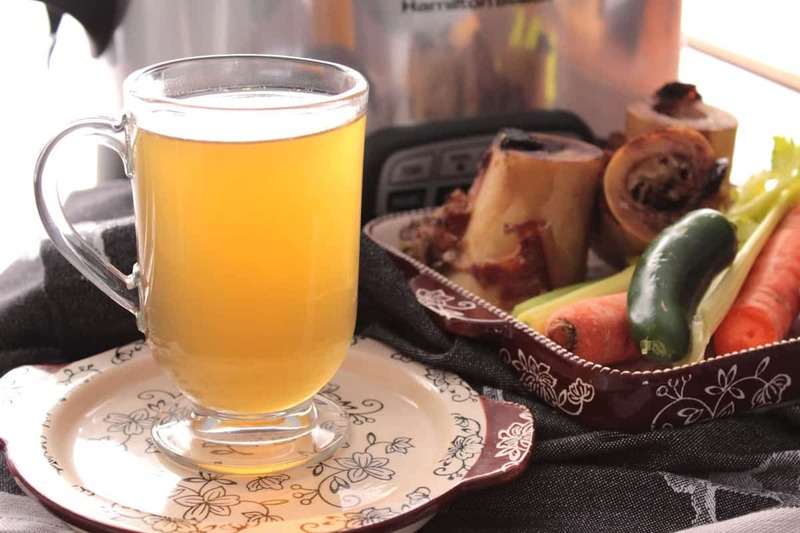 Cut in half, and serve hot. A box grater can be used in place of a food processor (if needed) to shred the cheese. The aluminum foil can be used to cover the sandwiches as the cook on the second side. 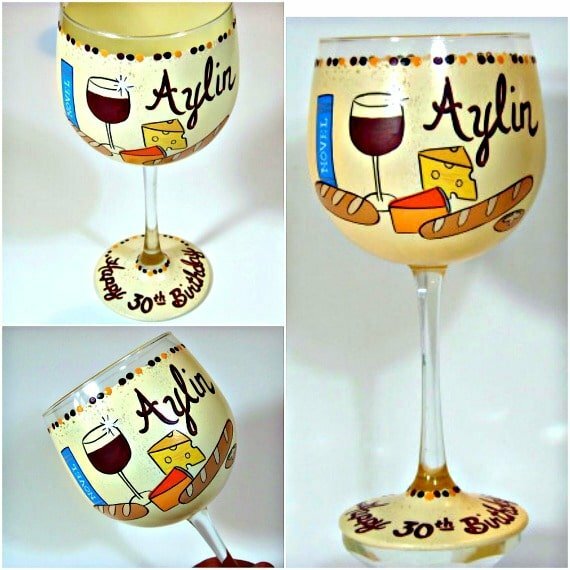 Feel free to switch up the cheese on these if you like, but if you're using a dryer cheese (such as the aged cheddar) then I still recommend combining it with the brie and wine, which will act like a binder. Depending on the size of your skillet, you may be able to cook more or less sandwiches at a time. 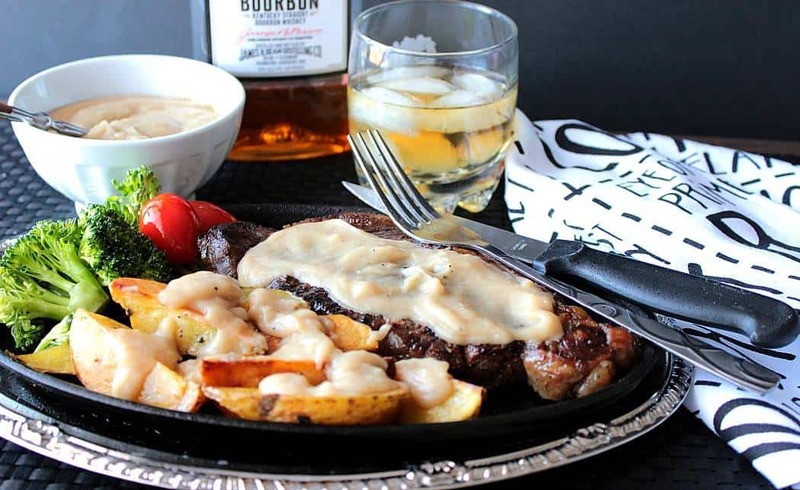 Make sure not to over crowd the skillet to leave ample room for flipping. If there is ever anything I can paint for you, from glassware items to fabrics (aprons and tea towels), please don’t hesitate to contact me by clicking on the little envelope icon at the top of my site, or by visiting my shop on Etsy and Wazala. Custom orders (like the one above), are always welcome and I will happily paint and design from any photo or description you send my way. Love the idea of processing the cheese and mixing it together before putting it on the sandwich. I usually just put slices on! The fried onions are brilliant, as is the delightful cheese blend – great idea! And honey-Dijon butter? I am seriously drooling! I’m so excited to try the honey Dijon butter spread. They are so caramelized just like I like them. I love that food processor step (but I know I’m far too lazy to do it). Brie and aged cheddar sounds like an awesomely delicios combo – I want to reach in and grab a half! Oooh, this is my kind of grilled cheese sandwich – LOVE the combination of brie, cheddar and those fried onions! 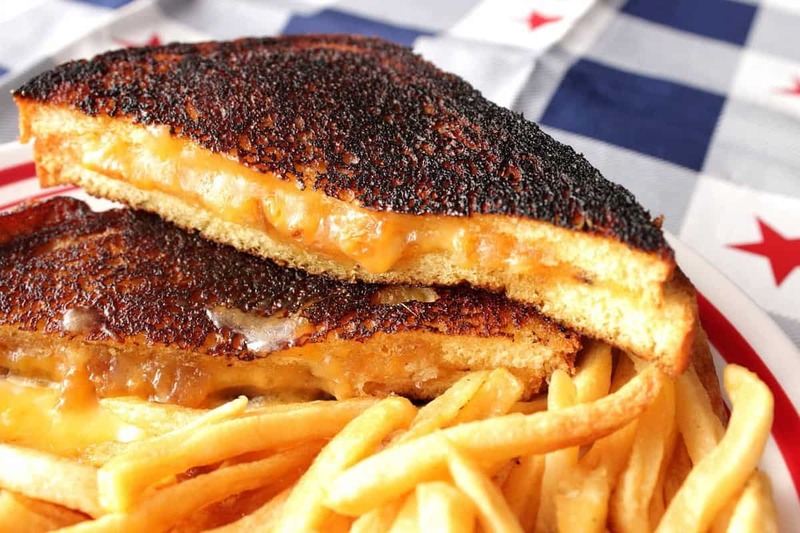 Now that’s a grilled cheese! I love this! Huh. I’d never heard of French fried onions before! I feel odd. Like I’ve been missing out on something so basic and important to daily life. Thank you for the introduction! 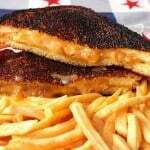 And this grilled cheese looks absolutely amazing. They’re so good! They’re crispy and crunchy and I think they’re sold by the breadcrumbs and stuff. I could eat them straight out of the bag (and I actually have)! Love all those cheeses mixed together!! Love the combination of cheddar and brie in these sandwiches. They look so cheesy and wonderful! Ohhhhh man. 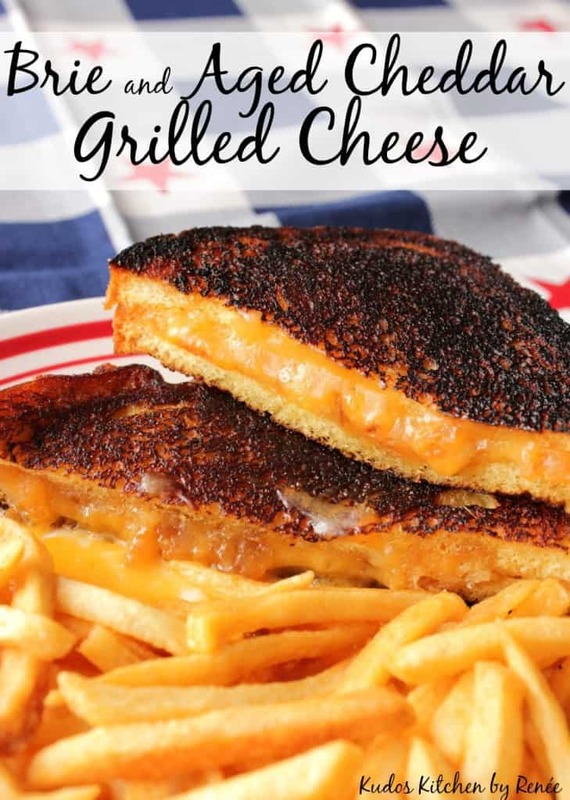 This is truly the ultimate grilled cheese! Oh how amazing this looks! Brie is a favorite of mine! 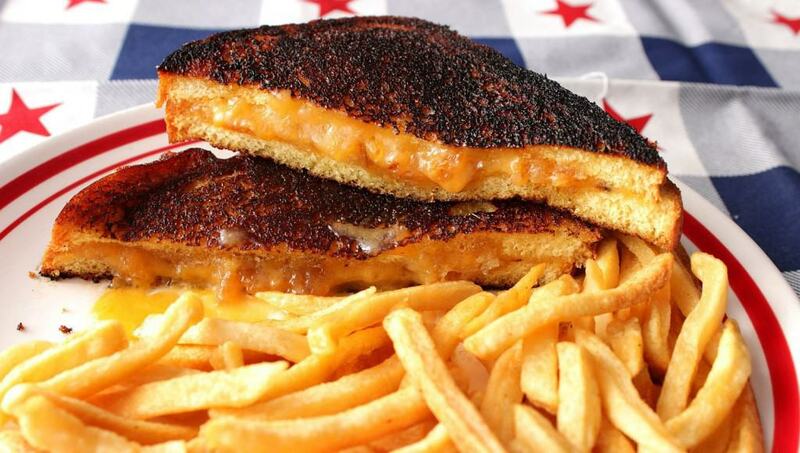 Now this is a grilled cheese I can sink my teeth into. This looks really inviting.